Fatalities among bicyclists are on the rise. According to the NHTSA, 818 bicyclists were killed in collisions with motor vehicles in 2015 alone, up from 729 the year before. About 45,000 bicyclists were injured in general roadway collisions that year throughout the country. The statistics are even more grim in Southern California specifically. Between January and May 2016, the area experienced 40 bicycle fatalities, much more than the 21 fatalities it saw for that same time period in 2015, according to the San Gabriel Valley Tribune. The majority of pedalcyclist fatalities happen in urban areas (70%) over rural areas (30%). Most pedalcyclist fatalities happen at non-intersections; three percent occur in bicycle lanes. Crashes that happen in the daylight hours vs. the dark are about equal; four percent happen at dusk which is a notoriously dangerous time to be on the roadway. In 2015, U.S. motorcyclist fatalities rose 8% year-over-year to 4,976 people, according to a report by the National Highway Traffic Safety Administration. Motorcyclists accounted for 14% of all motor vehicle fatalities and 4% of injuries. The highest number of fatalities occurred between the hours of 6 p.m. and 9 p.m. Most crashes happen in the fall (29%), followed by 27% in winter, 20% in summer, and 18% in spring. It’s also interesting to note that over the last decade, the average age of pedalcyclists killed in motor vehicle accidents increased by four years: from 41 to 45. Males are more likely to be hit while riding their bikes than females. In fact, the fatality rate per million people is about six times higher for men than women as reported in 2015. Distracted driving, alcohol and marijuana impairment, poor weather or road conditions…these are all contributors to bicycle vs. motor vehicle accidents. As a side note, not all bicycle injuries and fatalities involve contact with another motor vehicle. Yes, that is how the majority happen (nearly a third), according to the Pedestrian and Bicycle Information Center. However, other causes of bike accidents include falls, poor road conditions (potholes, cracks, rocks, etc. ), biker inattention, crash/collision (tree, parked car or other stationary obstruction), and even dogs or people who run out into the road unexpectedly. For those fatalities and injuries that occur as a result of a motor vehicle collision, many factors come into play, from texting and driving to alcohol involvement. In fact, 37 percent of all 2015 fatal pedalcyclist crashes stemmed from alcohol impairment. The use of alcohol isn’t always the responsibility of the motor vehicle driver. Sometimes, crashes result from the bicyclist imbibing alcohol before riding. More than 27 percent of cyclists who died that same year had blood alcohol concentrations (BACs) of .01 g/dl or higher. Distraction seems to be a major cause of cyclist deaths and injuries. 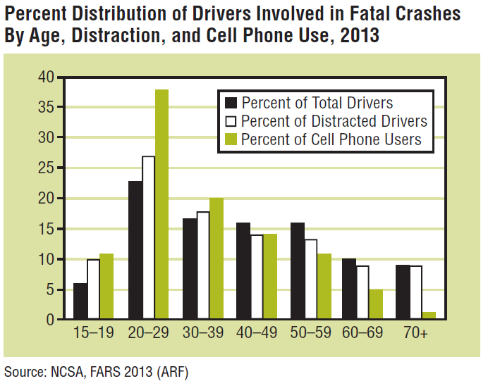 With so many motor vehicle drivers distracted behind the wheel, this alarming trend isn’t exactly surprising. Consider this: 52 percent of recent car crashes resulted from drivers who were distracted by their cell phones, found a study by Cambridge Mobile Telematics. Research shows that cell phone use among motor vehicle drivers has shot up over the last several years. The study also found that anti-cellphone laws have little to no effect on driver behavior. The NHTSA reports that distracted driving was involved in 10% of fatal crashes and 18% of injury crashes in 2013, with cell phones being involved in 14% of all fatal distraction-related crashes. In addition to clearly-defined bike lanes on city streets, many communities are proposing more stringent laws to help curb the rising incidence of distracted driving. For instance, lawmakers in New York and elsewhere are trying to pass a bill that would help law enforcement cut down on cell phone use by drivers. The “textalyzer” allows police to determine if a driver has been texting while behind the wheel, complete with time stamps, says a report on NPR. Keep an eye out for laws like that. You may see them come to fruition soon. Have you been the victim of a bicycle crash with a motor vehicle? Call Power Legal Group at 800-323-POWER for a free initial consultation. We are the trusted California personal injury lawyers for bicycle accident victims.